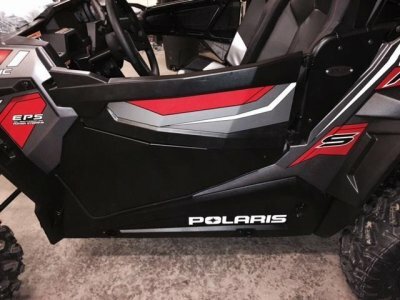 2014-15 RZR XP1K and 2015 RZR 900 Lower Door Panels without Inner Door Pockets P/N: 12823 Fits: 2014-2105 RZR XP1K and 2015 RZR 900, 55" & 60" Wide Models(this will NOT fit the Trail Models) Again, this does not fit the 50" Trail Model RZR 900. Only, the 55" & 60" wide. These are similar to our Lower Doors (P/N 12769)but without the pockets. Laser Cut and CNC formed. Made from .080” Thick 5052 Aircraft Grad Aluminum. Powder Coated-Texture Black. Sold as a set (drivers and passengers sides). Exposed edges are hemmed over making them smooth. Mounts to the stock doors. Made In Cleveland, Ohio. Block the mud and debris with the lower doors. The stock doors and latches work very well so these enhance what is already on your buggy. These can be installed in less than 30 minutes with only one hole per side needing to be drilled. The edges are hemmed over making them smooth. There is a rubber edge gasket included for the bottom edge. NOTE: these do not seal tight. They have a 1/14”-1/2” gap along the bottom much like tube style doors would have. We reserve the right to make modifications/improvements to our products at any time. Vehicles may have changes throughout the year. Therefore, pictures are a representation of the product you will be getting but may vary due to product revisions.